3D NAND is well on its way to become the main player in the flash memory market. 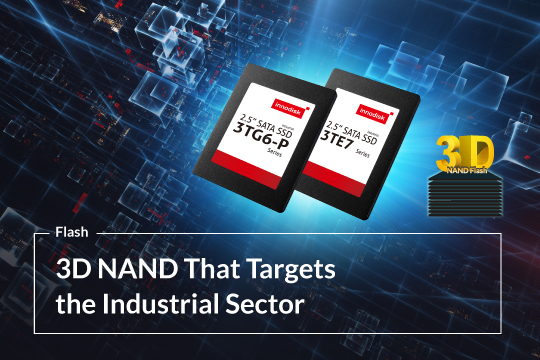 This next-generation NAND flash promises greater capacities and performance and is now available in a fully industrial-grade package through Assured Systems. This Innodisk solid state drive (SSD) series is designed to tackle the tough conditions seen in many embedded environments and to handle the challenges of edge computing. The devices use pure industrial-grade 3D TLC NAND from Toshiba with a rated P/E cycle number of 3000 that ensures lasting endurance as required by many embedded applications. The firmware is also optimized for industrial use and the SSDs strictly avoid SLC caching to avoid performance drops and increased write amplification that lower P/E cycle numbers through excessive data transfers within the SSD. The series includes two models: 3TE7 and 3TG6-P, with the former being DRAM-less and the latter using an external DRAM chip and a Marvell controller. The modules can incorporate AES encryption for data security and End-to-End Data Path Protection to ensure error correction at every point of data transfer. The modules can also be fitted with Innodisk’s trio of power stabilizing technologies iCell™, iPower Guard™ and iData Guard™ to further strengthen data integrity in areas susceptible to power fluctuations.